UFCW Canada plays a significant role in organizing and providing assistance to agricultural workers across Canada. While governments ignore the plight of agricultural workers, UFCW Canada has always been and continues to be committed to improving the working conditions of all agricultural workers. Over the past three decades, UFCW, through its Agriculture Workers Alliance (AWA) centres, has provided advocacy and support efforts to tens of thousands of domestic and migrant farm workers in Ontario, through fixed and mobile support centres. Assistance is provided to workers in their own language (through drop-in visits, phone calls, and outreach locations) on issues such as employer abuse; unsafe housing and working conditions; overcharging for rent or demanding recruitment fees; unilateral repatriations; and other threats or actions of employer reprisal. Today, in association with UFCW Canada, the AWA has grown into the largest national support organization for both foreign and domestic agriculture workers. Outside of Canada, UFCW Canada and the AWA have built an ongoing dialogue with sending governments, including Mexico, Guatemala, Honduras, El Salvador, Thailand, and Jamaica. Canada has seen a continuous expansion of the migrant and temporary foreign work force in corporate agriculture under federal programs that deliver migrant workers to employers, and then essentially abandon them to fend for themselves. It is an employer-driven system, assisted by the government, where many workers must accept danger and exploitation if they want to work in Canada. If they raise concerns, they are typically deported without a hearing or right of appeal and blacklisted from ever returning. It is our experience in Ontario, that the vulnerability of both domestic and migrant workers to employer abuse is directly reinforced by their inability to organize and compel employers to collectively bargain in good faith. Ontario is Canada’s largest agricultural centre. The evidence is clear to us, and to the tens of thousands of agricultural workers we have had direct contact in Ontario, that their ability to organize is hobbled by provincial legislation. This has been the case since the creation of the Ontario Labour Relations Act, except for a very brief period in the 1990s. 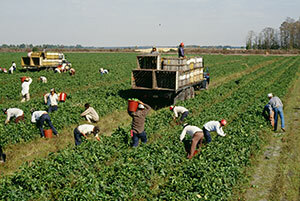 In 1993, the Agricultural Labour Relations Act ("ALRA") was proclaimed, giving Ontario agricultural workers the right to join a union of their choice and bargain collectively. Prior to the passage of the ALRA, the government consulted with UFCW Canada as the principal workers' representative. The ALRA was unanimously recommended by a ministerial advisory committee which included agricultural owner organizations, such as the Ontario Federation of Agriculture, and UFCW Canada.